'Auld Bailie Snap' begins: 'There is auld Bailie Snap he does reign in the east'. 'Ancient Striling' begins: 'Let minstrels sing of sparkling wine'. 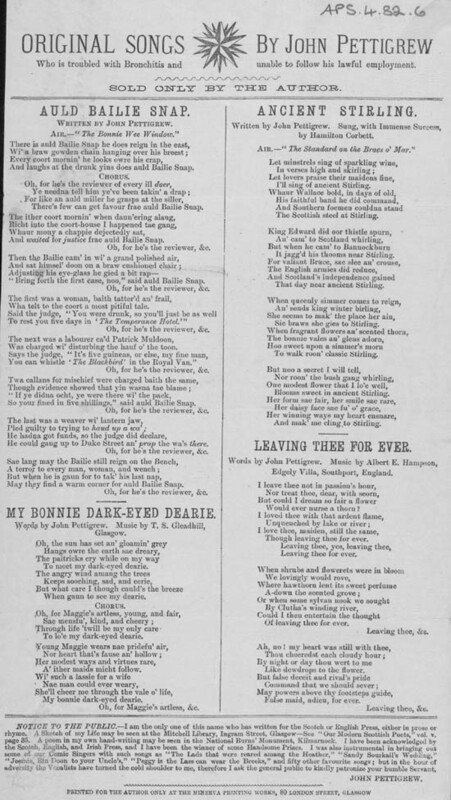 'My Bonnie Dark-Eyed Dearie' begins: 'Oh, the sun has set an gloamin' grey'. 'Leaving Thee for Ever' begins: 'I leave thee not in passion's hour'. The broadside was published for the author at the Minerva Printing Works, 80 London Street, Glasgow. It is not dated. This broadside appears to be an example of a phenomenon popularly known as 'vanity publishing', where an author pays to have his or her work published. One of the best known so-called 'vanity publishers' was Minerva Press, which was established in London in 1810, and it appears that John Pettigrew had his songs published by a Glasgow branch of this press. As the financer and sole distributor, as well as the author, of this broadside, Pettigrew appears to have had a great say in the design of the sheet. Unusually, he has included a curriculum vitae at the foot of the page, to prove his credentials as a songwriter. Pettigrew also credits additional composers or performers where appropriate.